We’re in the Collins family mausoleum again today, for literally the sixth day in a row. 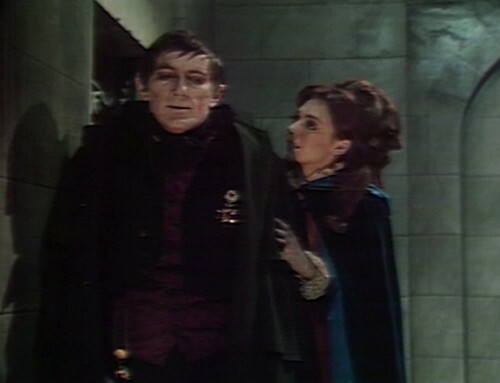 It’s been nine months since we opened the mystery box and unleashed the vampire on the world of Dark Shadows, and we’ve now reached the stage where the show is almost entirely graveyard-based. I remember the days when people on this show had homes to go to. Josette’s tracked down her ex-boyfriend Barnabas, who died recently and doesn’t seem to be committed to making their relationship work anymore. I think we’ve all had conversations like that, haven’t we, where the other person just won’t accept that it’s over? Somebody needs to buy Josette a copy of He’s Just Not That Into Biting You. This whole week is basically a push-pull dance between these two endangered lovebirds. This is the default setting for soap opera storytelling: two people made for each other, but kept apart by some dreadful secret or star-crossed circumstance. She’s pregnant with someone else’s baby, or he’s being blackmailed, or she’s the district attorney and he’s on trial for murder, or he thinks that she’s in love with his identical twin, or who even knows what. According to the narrative rules of the soap opera format, the fact that he’s a member of the living dead who lives in a crypt is just a detail. She wants to be with him, and he’s trying to let her go, and it’s killing him, again. The really remarkable thing about the Dark Shadows version of this story is that in a normal soap opera, this could go on for years. There are couples on daytime that have been doing exactly this dance for decades. These two have all the way until the end of next week. So here’s a little comedy sketch featuring the lovestruck couple. Josette: Barnabas, what has happened to you? Barnabas: I can’t tell you that. 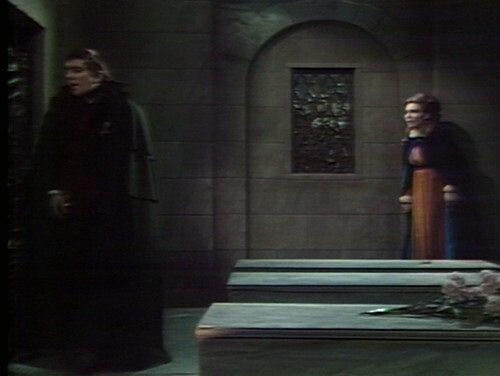 Barnabas: Oh, Josette, please, just go. Before it is too late. Josette: Too late? Too late for what? Josette: But what about us? Good question. We might need to back up a step, and give this some more consideration. 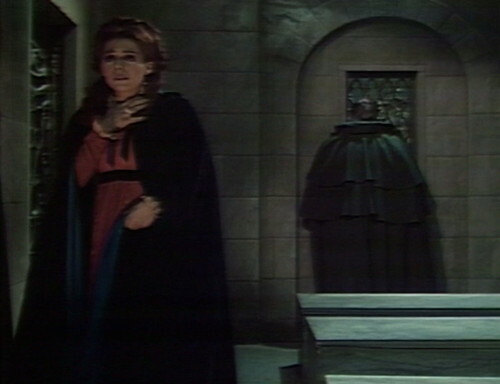 The weird thing is that Josette seems perfectly okay with the concept that Barnabas has come back from the dead. She’s not even curious about it. 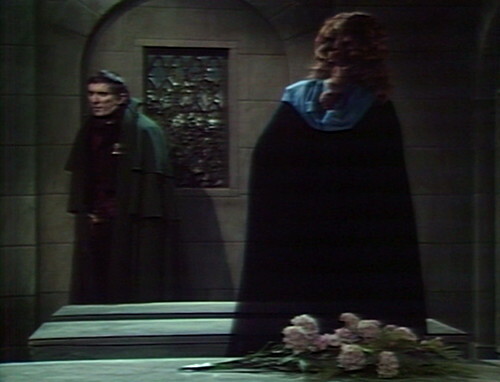 Josette: Barnabas, you told me you would come back to me. You told me to wait for you! 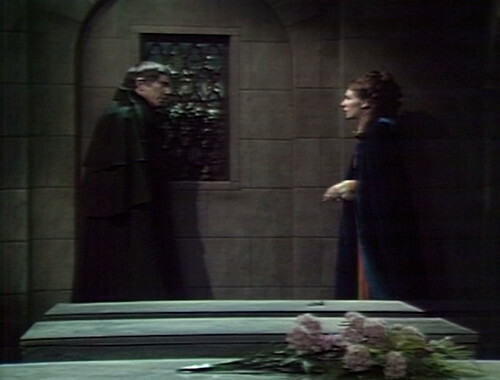 Barnabas: If I’d known then what it would be like after I came back, I would never have asked you to wait. I seriously don’t understand what she thinks is going on here. You can hear her losing IQ points every time she opens her mouth. Josette: But you did ask, and I did wait! Believing that this would be the beginning of a new life for us! 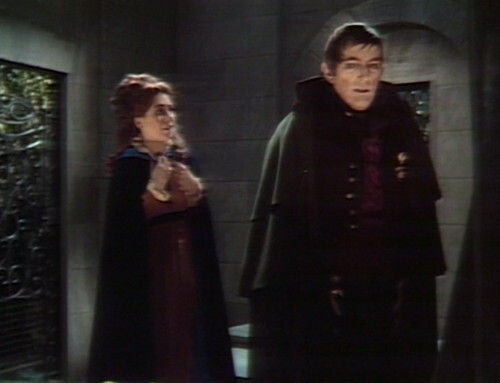 Barnabas: Josette, don’t talk that way! You don’t know what that new way of life would be like. Josette: I don’t care! All I know is that I love you, and I would do anything to be with you! Oh, no. She’s not Twilighting, is she? Please tell me she’s not Twilighting. As always, Barnabas expresses his feelings by way of the mysterious language of Fridspeak. 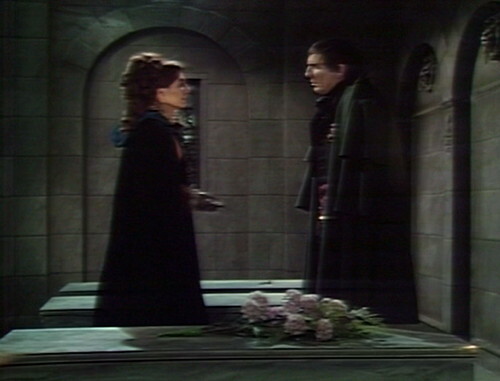 Barnabas: I will not let you do what you would have to do to be with me. And she still doesn’t get it. Josette: What do you mean? 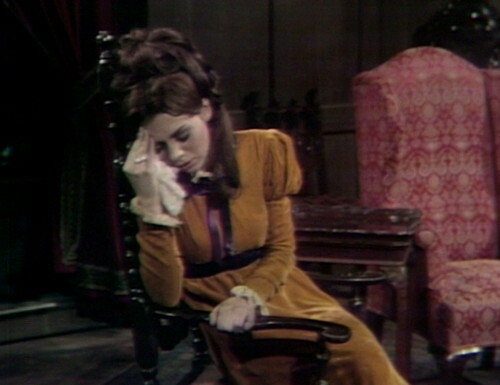 Barnabas: Josette… you will understand this. If it kills me, he adds, but only in my imagination. Barnabas: You were at my bedside when I died. And here I stand before you now, alive. How do you think that happened? Josette: I don’t care how that happened! All I know is that you’re back, and we must be together! Oh, man. She really is Twilighting. This is not acceptable. You may have heard about this obscure vampire romance series called The Twilight Saga, which tells the dramatic story of the worst girl in the world, as she calmly and systematically ruins her own life, and the lives of everyone around her. The heroine, Bella Swan, is The Worst Character in Fiction. She’s the ultimate Mary Sue character, a dull and depressing stand-in for the author, who has no redeeming qualities but is universally adored by everyone around her. The most despicable thing about Twilight is that the entire plot of the four-book series is concerned with the following question: Should a 17-year-old girl give up her life and her future — literally committing suicide — in order to please an adult man who dates high-school girls? The answer to that question, obviously, is that you should call the police before starting the next chapter. At one point in the second book, she actually asks the adult man’s family to vote on whether he should kill her or not. I forget how it all turns out. And unfortunately, Josette is getting dangerously close to that Twilight area. She has no job, no friends, no hobbies, no aspirations — no ties to anything that could give her a sense of purpose outside of her relationship with a guy who died two weeks ago. So why do we care what happens to her? The scene ends the only way that it can possibly end, with the two of them striking the most tragic poses they can think of, and fading out for the commercial break. On a normal soap opera, this would be our sad, creepy Bella Swan story, and they’d spend years running this presumptive heroine’s character into the ground, grinding the audience’s sympathy and respect into powder. But Dark Shadows isn’t a normal soap opera, and it’s definitely not Twilight, thank goodness. We get to drop-kick this girl into the sea next week, and not a moment too soon. Suki closes the door behind her as she enters the Eagle, but the door doesn’t shut. At the end of Act 3, Suki tries to stifle a cough as the scene fades out. The bartender at the Eagle, Mr. Mooney, is played by Bob O’Connell, who also plays the Blue Whale bartender in the present-day storyline. Usually, O’Connell is a non-speaking extra, but in this episode, he has a brief scene with Nathan, and he’s listed in the credits. Mr. Mooney returns in a month. GAK – I totally forgot this episode introduced Suki Forbes, the sensational character find of 1795! (or is it 1796 now?) Hope you talk a bit more about her next time. Yeah, I didn’t have a good opportunity to talk about her in this post. Suki will definitely get her due in Friday’s; she’s a favorite of mine. I liked Suki though she gets a bad rap on the DS lists because she tries to shake Nathan down for money. But I thought she was cool and the actress who played her was great. Too bad she wasn’t on for long and this actress never appeared on the show again. Shaking Nathan down for money is the best thing Suki does. People on the DS lists are okay with the vampire murdering people, but they draw the line at a little non-consensual alimony? So. Tell me, Danny: how do you REALLY feel about Twilight? When you compare the 1795 characters to their 1967 counterparts you can see a dramatic difference in each of them (Julia/Natalie, Vicki/Vicki, Carolyn/Millicent and of course Maggie/Josette). They lose their character traits from the present and ‘degerate’ into seemingly helpless females, and in the cases of Josette, Millicent, and 1795 Vicki not being able to function without a man in their lives. Normally this could be attributed to the way of the world back in the 18th century when most women had no jobs and were expected to marry and have children before their 21st birthdays (never mind any girls night out because women couldn’t go into bars unless accompanied by a man). The sad part is that when the show returns to the present day most of the female characters (excepting Julia) seem to retain these ‘helpless female’ personas. However I really liked the character of Suki Forbes and wished she had a larger role in this storyline (and in future ones as well). She came in with a strong presence similar to that of Angelique but her character left the show way too soon.. I also like Naomi’s character growth. She starts off under Joshua’s thumb in what is clearly a very unhealthy relationship, but by the end she’s found her own voice and is able to stand up to him and choose her own fate (as bad as it is). But I concur about the return to 1968. Agree – Grayson Hall and Clarice Blackburn was in a class of her own no matter what characters they were playing. Naomi came across as stronger as the story went on and her world didn’t revolve solely around Joshua. I think before she killed herself,Naomi hung around in order to helped Millicent and Daniel but Barnabas being a vampire was just too much.”Naomi came across as stronger as the story went on and her world didn’t revolve solely around Joshua.”Toward the end she was strong enough to not cared what her husband thought”. Also if Natalie acted more like present day Julia she would have drugged Josette and shipped her off on the next slow boat back to Martinique. another fantastic review! love it. and also let me say, all your reviews -and your titles – are absolutely brilliant. i know i’m late to the game, and i dont know if you are going back to read these comments, what with you currently writing up the 600-and-somethingth episode, but i gotta give props! i’m thoroughly enjoying all your entries. i watch the episode, and then read what you wrote. or if i’m feeling really adventurous, i’ll pan back and forth between the two. THANK YOU! I read all the new comments, so I’ve been enjoying your thoughts as you’ve been going along. 🙂 I’m really glad you like the blog! I love your recaps. I think I can be pretty much certain that, fun as this show is, I would not still be watching it if it weren’t for your blog. So thanks for that, Danny. You’ve got me hooked. I’ll never get free. I’d curse you with a curse of awesomeness if someone hadn’t obviously beaten me to it already. It sounds like the Collinsport Dumb Water hit Josette hard.